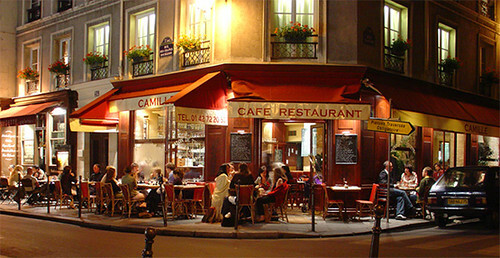 Paris bistro at night, Marais district, originally uploaded by Ted Drake. This cafe is in the Marais, near Place des Vosges. Paris is a great city to photograph at night and in the early morning. I didn’t have a tripod with me this night, so I used a small bag of rice to steady the camera on a street pole. This image was shot on a Sony digital camera.